Apple’s launch of the iPhone 4S helped the Cupertino-based company close the gap on sales of Android smartphones in the fourth quarter of 2011, almost doubling its market share in the U.S, the latest research report from Nielsen reveals. 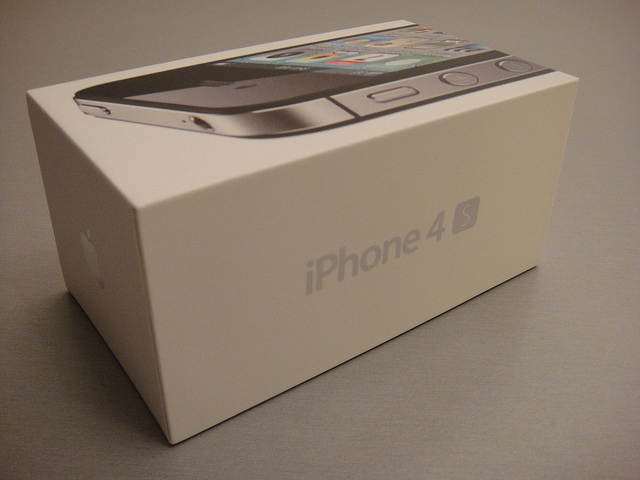 In the final quarter of last year, 44.5% of respondents said they chose an iPhone, an increase of 19.4 percentage points from October, with 57% of the new owners choosing to purchase an iPhone 4S, which launched in the US, Australia, Canada, France, Germany, Japan and the UK on October 14 2011. Android still leads the smartphone market, holding 46.3% of the market, compared to 30% for Apple’s iOS platform and also dominates sales over the past three months with a 51.7% share of the market, compared to 37% for iOS. This took into account that 46% of US mobile customers had a smartphone device, with 60% of new device owners over the past three months choosing a smartphone over a featurephone. 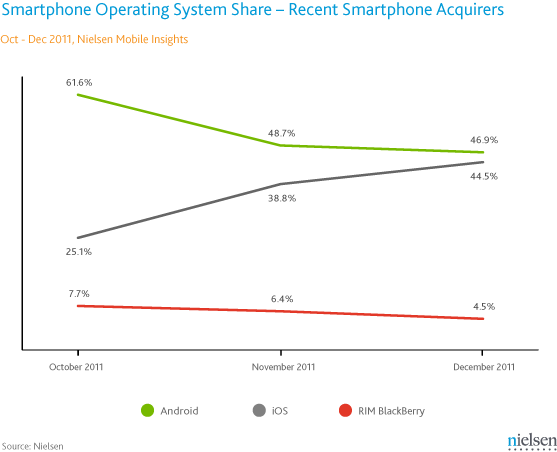 RIM saw it’s U.S market share slip over the last three months, with just 4.5% of respondents choosing to buy a new BlackBerry smartphone. 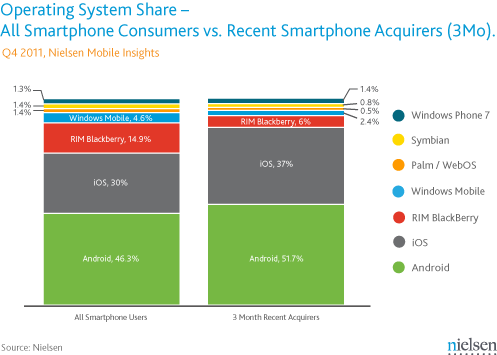 However, RIM still held a 14.9% share of all smartphone users. Nielsen’s report highlights fully the huge growth of the Android and iOS platforms, demonstrating the dominance that Google and Apple have over the smartphone market. Apple is expected to announce smartphone sales from its last quarter later this month, providing an accurate performance overview of its iPhone handsets. We know that the iPhone 4S broke records but the stats here show sales of its older models are still performing well.